Сurcumin derivatives were virtually screened for inhibitory activity towards SERCA by computational docking. A detailed characterization of the inhibitor binding site at the molecular level and determination of the amino acids involved in interactions with curcumin and its derivatives have been provided. Crucial enzyme/inhibitor interactions were identified by analyzing the docking-predicted binding poses of active compounds. 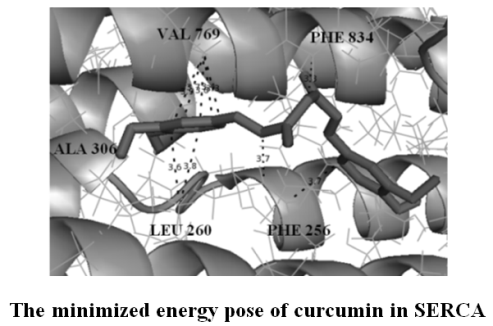 The loss of hydrophilic group by curcumin leads to an increase in binding energy. Some of curcumin derivatives showed better docking energies than curcumin indicating that they could be potent enzyme inhibitors. Additional binding energy was provided by extensive hydrophobic interaction between the hydrophobic parts of the ligands and the nonpolar residues at the binding site. Curcumin derivatives satisfy Lipinski’s Rule of five which testifies to their druglikeness (absorption, distribution, metabolism and excretion) and possible pharmacological activity. Moller, J. V., Juul, B., Maire, M. Le. Structural organization, ion transport, and energy transduction of P-type ATPases. Biochim. Biophys. Acta, 1996, vol. 1286, p. 1-51. Nakamura, J., Tajima, G., Sato, C. Substrate Regulation of Calcium Binding in Ca2+-ATPase Molecules of the Sarcoplasmic Reticulum II. Effect of CTP, GTP, ITP, and UT. J. Biol. Chem., 2002, vol. 277, p. 24191-24196. Toyoshima, C,. Nomura, H., Sugita, Y. Structural basis of ion pumping by Ca2+-ATPase of sarcoplasmic reticulum. FEBS Lett., 2003, vol.555, p. 106-110. Winther, A.-M. L., Liu, H., Sonntag, Y., Olesen, C., le Maire, M., Soehoel, H., Olsen, C.-E., Christensen, S. B., Nissen, P., Moller, J. V. Critical Roles of Hydrophobicity and Orientation of Side Chains for Inactivation of Sarcoplasmic Reticulum Ca2+-ATPase with Thapsigargin and Thapsigargin Analogs. J. Biol. Chem., 2010, vol. 285, p. 28883-28892. Che, C. M., Chiu, P., Ko, B. C. A Novel Inhibitor of the Sarcoplasmic/Endoplasmic Reticulum Ca2+ ATPase Pump, Induces Autophagy, Endoplasmic Reticulum Stress, and Apoptosis. Mol. Cancer. Ther., 2010, vol. 9, no. 3, p. 718-730. Ogunbayo, O. A., Michelangeli, F. The widely utilized brominated flame retardant tetrabromobisphenol A (TBBPA) is a potent inhibitor of the SERCA Ca2+ pump. Biochem. J., 2007, vol. 408, p. 407-415. Paula, S., Abell, J., Deye, J., Elam, C., Lape, M., Purnell, J., Ratliff, R., Sebastian, K., Zultowsky, J., Kempton, R. J. Design, synthesis, and biological evaluation of hydroquinone derivatives as novel inhibitors of the sarco/endoplasmic reticulum calcium ATPase. Bioorg Med Chem., 2009, vol. 17, no. 18, p. 6613-6619. Singh, N., Misra, K. Computational screening of molecular targets in Plasmodium for novel non resistant anti-malarial drugs. Bioinformation, 2009, vol.3, no. 6, p. 255-262. Takahashi, M., Kondou, Y., Toyoshima, C. Interdomain communication in calcium pump as revealed in the crystal structures with transmembrane inhibitors. Proc. Natl. Acad. Sci. USA, 2007, vol. 104, p. 5800-5805. Wang, L., Song, R. Targeting Sarcoplasmic/Endoplasmic Reticulum Ca2+-ATPase 2 by Curcumin Induces ER Stress-Associated Apoptosis for Treating Human Liposarcoma. Mol. Cancer. Ther., 2011, vol.10, no. 3, p. 461-471. Moncoq, K., Trieber, C. A., Young, H. S. The Molecular Basis for Cyclopiazonic Acid Inhibition of the Sarcoplasmic Reticulum Calcium Pump. J. Biol. Chem., 2007, vol. 282, p. 9748-9757. Lape, M., Elam, C., Paula, S. Comparison of current docking tools for the simulation of inhibitor binding by the transmembrane domain of the sarco/endoplasmic reticulum calcium ATPase. Biophys. Chem., 2010, no. 1-3, p. 88-97.